An impressive debut album from this young singer. The female vocal scene has become quite crowded of late, but she has the style and personality to make a mark. Zakian can make a melody swing without beating it into submission first, and sings with a smile on her face – a pleasant relief after some of the doom-laden tones one hears so often these days. Her accompanying quartet features that excellent pianist Steve Melling and trombonist Mark Bassey, a superb, witty player and one to watch out for in the near future. Making an impact as a jazz singer is as hard as doing so as a tenor saxophone player – the competition, particularly for women, is so intense that hardly a month goes by without several new thrushes chirping on the bough. Though not as intensely individual as, say Patricia Barber or Abbey Lincoln, Miss Zakian debuts with a clear conception of how to phrase a lyric with subtle swing and rhythmic elasticity – and how to express an emotion without over-egging the pudding. Twisted a la Annie Ross stretches her range a bit, but there is compensation in performances like Day By Day, the touching Company and the haunting rumba treatment of If I should Lose You. Mark Bassey’s feisty trombone is an important additional voice, providing lively solos as well as textural contrast, but it is Zakian who puts the cream in the coffee. Genteel debut from Pizza-On-The-Park favourite and jazz festival grafter. 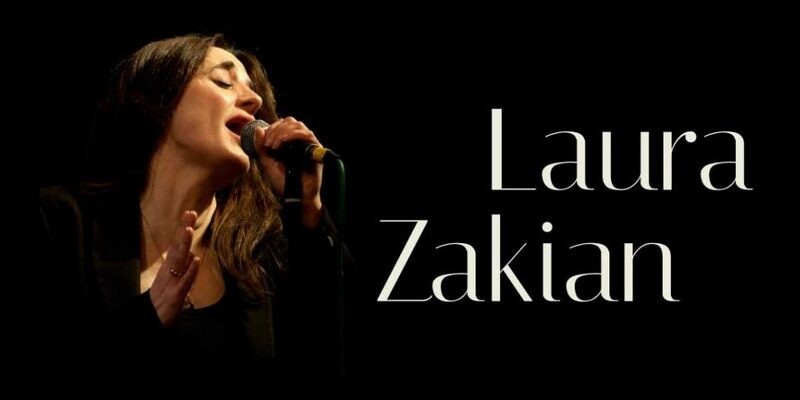 Attendees of Laura Zakian’s singing classes – hey, jazz performers make their living as they can – must marvel at her technique which has a sweet, poppy accessibility, but also the confidence to explore the barmier regions of the genre. Ably accompanied by Steve Melling (piano), Richard Jeffries (bass), Russell Morgan (drums) and Mark Bassey (trombone) most of whom back her live, this is an outward-looking repertoire:jazz without frightening the horses. Thus, alongside cool interpretations of standards such as The Touch Of Your Lips and If I should Lose You there’s also Tom Waits’s Broken Bicycles, and a marvelous, sinuous version of Ricki Lee Jones’s Company. Delightful. On this satin-finish first from one of Blighty’s most vivacious jazz vocalists, Zakian administers her impressive range and inspired arrangements to a clever mix of songs that avoids the usual well-known numbers. There are tasty morsels for jazzsters and dabblers alike: from the finger-clicking opener Touch of Your Lips, through the zany Nobody Else But Me to Tom Waits’ melancholic Broken Bicycles and the smooth finale This is Always. It’ll make you want to grab a whisky soda, light a cigar and lounge in a dark bar. I first heard Ms Zakian at the 2001 Malborough Jazz Festival and thought she was the best jazz singer I’d heard in a very long time. Her performance at the same venue this year and the music on this CD, her first, confirms everything with performances that are, if anything, even better. She always sings the complete lyrics to her selected material and has a way of phrasing and accenting certain notes that make sure everything she sings comes out as jazz. Laura’s voice is clear and resonant and she never resorts to high volume for effect as so many vocalist do. She is that rare animal, a genuine jazz singer who uses her voice as a musical instrument and improvises and reshapes melodic lines to put a song over effectively. Singing of this standard requires the best in accompaniment and that is precisely what she receives from Melling, Jeffries and Morgan, with trombonist Mark Bassey adding additional colour on several tracks. Melling’s sonorous accompaniment and individualistic solos are a special bonus here. Add the muscle and accurate note placement of Jeffries on bass and Morgan’s mastery of the almost lost art of wire brush playing and you have a superb jazz album. These musicians swing, collectively and individually at all times on these eleven selections. Lesser know pieces like Gentleman Friend and Broken Bicycles sound good as Ms Zakian sings them and will soon become familiar if you play them as many times as I have already, but she really comes into her own on standards like If I Should Loose You and she is terrific on Wardell Gray’s blues line Twisted with the lyrics made famous by Annie Ross. Satin smooth vocal delivery, subtle but highly effective if not downright seductive reading of a lyric and a laid back swing, all these attributes are in evidence and you can add on a superb instrumental quartet. It all adds up to a dynamic jazz disc and it will be one of my top ten at the end of the year. Very highly recommended.